The FTI Consulting business advisory firm surveyed a set of 130 global institutional investors to gauge the depth and breadth of U.S. assets invested using ESG principles. This group of investors, contacted from May through July 2018, responded that their Assets Under Management totaling US$8.4 trillion was believed to have benefited by the contribution of extra [corporate] value to a company with a high ESG rating. And an “extremely positive/high ESG rating” might add an extra 22 percent of corporate value, said the survey responders. An earlier survey by the same firm – FTI Consulting – revealed that more than 2,000 large-cap global leaders expressed the same views. There are two factors at work here: (1) there’s greater demand for [qualified] corporate stock by the ESG-conscious investment community; and, (2) the perception that these higher corporate ESG / sustainability performers may be better positioned for the future (yes, they’re more sustainable) and be less likely to encounter regulatory issues and activist activities that could impact reputation and valuation. In the company’s FTI Journal the authors point that while ESG was once “nice to have” (dating back from the introduction of the phrase in corporate and investing circles a decade-and-a-half-ago), today ESG is integral to a company’s planning and strategy-setting in the eyes of the institutional investor. A significant share — 87% — told FTI Consulting that an extremely-positive/high rating would add to a company’s worth. The survey results include the specific views on this by country (Japan leads, the G-20 nations’ responders are in the middle; the USA is 8th in holding those views). So, on the part of the asset managers, what are they looking at in terms of the sources of ESG (from the ratings/reporting services for investors)? They responded: Bloomberg’s ESG Data Service; MSCI ESG Research; Sustainalytics Company ESG Reports; ISS (now adding E and S QualityScores to the long-term G/governance score); CDP; the DJSI; RobecoSAM; RepRisk; VigeoEIRIS; and Oekom. Here’s an interesting finding: more than half of the institutional investors claim they don’t know how the third party ratings organizations compile their reports. There’s more detail and charts for you in the Top Story this week. There’s also an interesting development briefly described in the second item up top. * The G-20 international forum consists of the world’s leading sovereign economies (19) and the European Union (28 states today including the United Kingdom). The big economies are there: USA, Germany, Canada, China, Australia, Saudi Arabia; Japan. Smaller economies such as Turkey and Argentina participate. Other key players participating include the World Bank; the IMF; the International Labor Organization; WTO; and, the United Nations. Who is asking for this? What will this cost? And where is the ROI for our efforts? Working with client organizations we see the firms’ customers and clients asking their supply chain partners about their respective sustainability efforts and requesting extensive ESG information, directly of the firms (with detailed questionnaires) and through third parties such as EcoVadis and CDP Supply Chains. The questions are coming faster and more detailed than in previous years. The important customer with a range of sustainability-themed “asks” of course considers their supply partners to be part of their (the customer’s) overall sustainability footprint – and so the questions. Corporate sustainability leaders understand the importance of the “ask” and provide detailed answers to their valued customers. That’s some of the essence of a timely report – “Sustainability: The Missing Link” – that was authored by the Economist Intelligence Unit and sponsored by LLamasoft, an Ann Arbor, Michigan-based supply chain management software provider serving such clients as Ford Motor, 3M, Intel, Bayer, and Kellogg’s. Highlights of the report and important background come to us this week from Supply Chain & Demand Executive magazine, with an interview with Dr. Madhav Durbha, Group VP at LLamsoft. The interviewer explores how sustainability considerations cause companies to think differently about their supply chains and examples of global companies are managing the triple bottom line. There are numerous helpful hints for you in this week’s Top Story. SDC/Supply Chain & Demand Executive magazine, published by b-to-b media & intelligence company AC Business Media, covers warehousing, transport, procurement and sustainability, among many topics. Subscriptions to SDCExec.com are free. (Wednesday – March 27, 2019) Source: Supply and Demand Chain Executive – Dr. Madhav Durbha of LLamasoft offers insight into why–with the proper tools–organizations don’t need to choose between profitability and sustainability, despite current economic uncertainty. Developing Green Firm Specific Advantages (GFSAs) allows firms to build business capacities and assets that enhance both economic and environmental performance. However developing GFSAs focused solely on environmental management capacity will be inadequate to deliver sustainability and long term financial performance. An additional set of GFSAs that build capacity to manage the social dimension of the people, planet, profit equation are required. These relate to the internalisation of the social contract, operational approaches that develop social equity, and communications approaches focused on inclusive constituency building. Sustainability frameworks build on the fundamental concept of the “triple bottom line” (TBL) balancing the needs of profit, planet and people. The TBL concept aims to broaden the focus of business performance from profit and loss to tracking and managing a company’s economic (not just financial), social, and environmental impact. This enables companies to understand the full costs of doing business and calculate real value added. Today risks associated with climate change, resource scarcity, increasingly stringent government regulation and consumer pressure for transparent and accountable business practice have shifted the focus of sustainability from a simple demonstration of corporate social responsibility to a core driver of commercial viability. Yet business leaders still seldom pay the same attention to people and planet targets as they do to achieving profitability (source: Elkington 2018). The definition of “green” firm specific advantages (FSAs) first developed in the 1990s acknowledges that firms are likely to invest in better environmental performance only if they will also lead to higher economic returns. Green FSAs (GFSAs) are business capacities and assets that allow firms to enhance both economic and environmental performance by enabling them to respond to and leverage evolving environmental challenges to achieve sustainable growth and competitive advantage. Developing GFSAs has a range of benefits for firms including cost and operational efficiencies, improved innovation and technological capabilities, enhanced product differentiation and market opportunities, and reputational enhancement (Singh et al 2014). 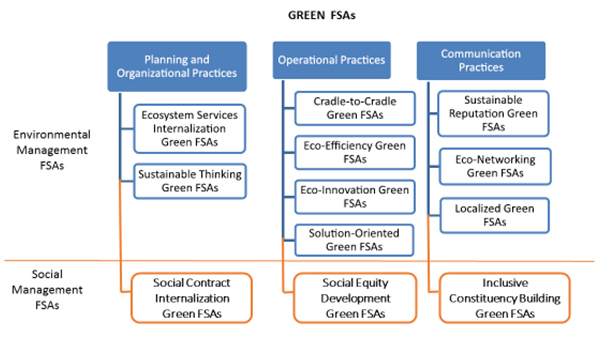 However, the definition of “green” FSAs related only to environmental management capabilities, creates an unbalanced framework that ignores critical capacities and assets that firms need to manage the social dimensions of sustainability that are increasingly critical to ensure both environmental and financial performance. Though much of the sustainability industry of consultants and framework developers continue to equate “sustainability” and “green” approaches with environmentally-friendly and carbon neutral, the new generation of “green” frameworks explicitly link these issues with social equity and inclusion. The United Nations calls for “Green Economies” which are “low carbon, resource efficient and socially inclusive” (UN Environment). The current “Green New Deal” policy resolution in the USA emphasises the role of environmental crises and economic transformation in exacerbating “systemic injustices” by disproportionately affecting already disadvantaged “frontline and vulnerable communities.” (Green New Deal Policy Resolution, 2019). There is ample evidence that businesses are increasingly confronted with risks related to social equity and inclusion that threaten both their commercial and sustainability performance. In a recent survey 80 percent of businesses said they expected their company to be affected by changes to “the social contract” (defined as the general agreement on the rights and responsibilities of members of society) over the next 10 years. These include workforce risks related to payment of a living wage, technology replacing jobs, and erosion of worker benefits through efficiency measures such as outsourcing. They also include risks from tensions arising from increasing social inequalities, and rising expectations of the role of business in solving social issues, creating a situation where “Social license to operate is at a higher standard than regulatory license to operate” (BRS 2017). These trends highlight the limitations of cultivating GFSAs that address only a firm’s environmental management capacity to deliver long-term business sustainability or financial performance. Firms also need to develop “new green” FSAs to strengthen their ability to engage a wide range of stakeholders around a mutually beneficial social contract. As with the GFSAs defined by Singh et al, the social set of GFSAs also need to be embedded into the firm’s planning and organisational practices, operational practices and communications. This effectively creates an additional layer of GFSAs related to “social management” (for want of a better term) as shown in the diagram below. These relate to the internalisation of the social contract, operational approaches that develop social equity, and communications approaches focused on inclusive constituency building. In the broadest terms Social Contract Internalization GFSAs relate to a firm’s capabilities to incorporate relevant social trends and expectations into strategic planning and develop strategies to mitigate risks related to the impact of their business operations, products and services on different social groups and wider patterns of inequality. Developing this perspective allows firms to internalise the social costs of products, technologies and business practices, and balance environmental management and operational efficiencies with social equity considerations. Social contract internalisation GFSAs therefore enable firms to develop socially sustainable workforce capacity and supply chain relationships. This includes adopting approaches to measure, report on and address the gender pay gap by which men are still paid more than women for equal work in nearly every country in the world (Rubery, 2019). It also includes adopting proactive strategies to manage the full range of costs to workers, supply chain actors and communities associated with practices such as the dematerialization of products, sourcing of eco-friendly inputs, achieving resource efficiencies, outsourcing and technological innovation. For example by assessing the social impact of a shift from producing or using non-renewable to renewable resources such as biofuels on producer communities smallholder agriculture, livelihoods and food security (UNRISD 2012). It also includes developing human resource management strategies that ensure workplace health and safety and freedom from discrimination and harassment, and proactive strategies to address inequalities in access to employment or livelihood opportunities. Beyond this, firms can develop the capacity for product innovation and expansion to new market segments to address inequalities in access to sustainable products and services between different social groups. The International Labour Organisation (ILO) defines “Green Jobs” as those that both provide employment in the production of green products and services or in environmentally friendly processes AND meet the criteria of decent work by ensuring productive work, a fair income, security and rights at work, social protection, social dialogue and gender equality (ILO 1 & 2). Yet the social dimension is still often absent from “green” jobs. A recent study of around 300,000 organisations in Portugal found that the green job sector employs workers with lower qualifications and has poorer provision and lower coverage of Occupational Health and Safety Services resulting in a higher incidence and severity of accidents at work (Moreira et.al, 2018). Internalization of Social Contract Green FSAs would therefore help firms to mitigate risks and reduce costs of workplace accidents, and demonstrate commitment to reducing the vulnerabilities of low income workers. Social equity development GFSAs recognize that the unequal distribution of risks and rewards within commercial value chains ultimately pose a threat to the long-term sustainability and financial viability of current business models. This is most apparent in the global commodity supply chains where price fluctuations and buying practices such as spot trading create high risk for producers and suppliers that threaten the whole supply chain. Social equity development green FSAs enable firms to develop business practices and operational processes to share risk and balance the social equity of key actors in the supply chain such as developing long term supplier agreements and investing in producer capacity. Building social equity in supply chains enables firms to ensure business continuity and implement effective environmental management with producers as long term partners. It also enables firms to develop speciality products based on quality, transparency and local knowledge, enhance brand value develop product portfolios, and satisfy growing consumer demand for authenticity and transparency (Brown 2018, Samper 2018). Social Equity Development Green FSAs Example – Mars Sustainable in a Generation Plan drive a new approach to commodity sourcing. Alongside actions to address GHG emissions, water stress, land use, and deforestation the Sustainable in a Generation Plan commits to meaningfully improve the working lives of one million people in its value chain to enable them to thrive. The concept of inclusive constituency building goes beyond reputation management, operational partnership development and targeted engagement with local stakeholders already identified in the GFSA framework. Rather it recognises the increasing consumer demand for businesses to demonstrate strong social purpose and to participate in a company’s broader vision. (Brown 2018, BBMG 2017). A recent global survey shows at least half of consumers believe brands can do more to solve social ills than government and that it is easier for people to get brands to address social problems than to get government to take action. Moreover 57% report buying or boycotting brands based on the brand’s position on a social or political issue (Edelman 2018). Inclusive constituency-building GFSAs enable firms to develop purpose driven narratives to engage consumers, investors, supply chain actors, local communities and wider stakeholders such as governments, regulators and NGOs in an ongoing relationship based on transparent communication and accountability to build a broad coalition of support for their activities products and services. This allows firms to develop stronger brand value and engage proactively with employees, customers and peers as brand ambassadors. It also increases firms’ ability for early sensing of societal concerns and foster an organisation-wide culture of listening and engaging with stakeholders that creates goodwill, can transform conflict into productive collaborations and garners “benefit of the doubt” support in regulatory compliance and public approvals processes. Inclusive constituency building GFSAs also build firms capacity to engage in constructive dialogue to drive product innovation, enhance creativity and strengthen employee motivation through the inclusion of wider perspectives (Sharma and Vrendenberg 1998). Amazon is one of the most financially successful companies in the world, and has made environmental sustainability commitments to increase its use of renewable energy and make all amazon shipments net zero carbon, with a target of 50% by 2030. Yet the company’s financial and environmental management strategies are undermined by its failure to develop an inclusive constituency for its brand. Amazon recently pulled out of a deal to set up a new headquarters in New York City, fearing damage to its reputation from a barrage of objections from politicians, unions, public housing residents, local community leaders and government institutions. These objections echoed Amazon’s failure to address poor labor practices and anti-unionisation policies, or to contribute to alleviating social inequality issues to which it contributes, by threatening to halt growth in its home city of Seattle if the city approved a tax on large employers to fund homeless services and low-income housing (Sainato, 2018). The failure of the deal has been attributed to Amazon’s failure to develop a robust strategy to build support amongst key stakeholders groups and miscalculation on how much it needed to engage with those audiences to make the development of the New York HQs a success (Goodman and Weise, 2019). To adequately ensure sustainability including environmental management and financial performance, Firms need to develop an additional set of Green FSAs focused on the social dimension of the people, planet profit equation. Social contract internalisation GFSAs that incorporate a social equity and inclusion perspective into strategic planning enable firms to develop socially sustainable workforce capacity and supply chain relationships and strengthen capacity for product innovation and market positioning. Social equity development GFSAs that build capacity to rebalance risk and build inclusiveness in supply chains enable firms to ensure business continuity and implement effective environmental management strategies based on long term partnerships and to develop product differentiation. Inclusive constituency building GFSAs that build capacity to engage stakeholders in a broad coalition of support for a firm’s activities products and services allow firms to develop stronger brand value, sense and respond to societal concerns and drive product innovation, creativity and employee motivation through constructive engagement with wider stakeholder perspectives. This is the “final paper” authored by Ruth Rennie as she completed the on-line, self-study “Certification in Corporate Responsibility and Sustainability Strategies” hosted by Governance & Accountability Institute and developed by Professor Nitish Singh, Ph.D., Associate Professor of International Business at the Boeing Institute of International Business at Saint Louis University, and founder and consultant at IntegTree LLC; and, Instructor Brendan M. Keating, Adjunct Professor at Wilmington University and VP of IntegTree. The professionals completing the course work receive certificates from the Swain Center for Executive & Professional Education at the University of North Carolina Wilmington and from G&A Institute. The certification program provides a broad overview of key corporate responsibility challenges and strategies that will enable organizations to succeed in the 21st Century Green Economy. There’s long been a spirited competition in the corporate sector along the lines of the popular “top of” or “best of” lists (with rankings) that companies are awarded, and/or that companies pursue in the effort to garner more third party recognitions and awards. In recent years, there’s been a steadily-increasing number of such contests focused on governance, social and environmental issues. Popular audience “top 10” awards seem to proliferate overnight (like mushrooms in the forest) coming forth from publishers, NGOs, conference organizers, trade associations, professional membership organizations, academia, and others. All are welcome to some degree by investors and stakeholders and can add luster to the company reputation and brand. Indeed, here at G&A Institute we have well beyond 400 “corporate awards and recognitions” related to ESG / Corporate Sustainability, Corporate Responsibility, Corporate Citizenship, et al…identified and profiled to help client companies round out their third party awards roster with relevant, suitable recognitions of different kinds. The competitive kinds that we’re all familiar with include Best in industry. Best workplace for women. For LGBTQ employees. Best business sector economic development contributors in the state (the Governor’s Award). Best companies for Hispanic or African-American engineers…and on and on. Some of these types of recognitions are well known and for investors and stakeholders, welcomed signals of third party recognitions of a company’s citizenship, responsibility or sustainability / ESG progress and achievements. Many awards began as editorial features of magazines. (In past years, members of our team worked with Fortune on a “Best Places” annual award.) Forbes is another well-regarded business and finance publication with much-followed awards for companies (the Best Employers List; Best Employers for Diversity; Top Companies to Work For, and more). And then there are the all-important ratings, rankings, scores, index/benchmark selections that many more public companies are receiving from such service provider organizations as MSCI, Sustainalytics and Institutional Shareholder Services. There are many robust corporate ESG profiles in the Bloomberg platform or on Thomson Reuters’ Eikon (now, “Refinitiv” branded); and coming forth from a host of other ratings organizations in the U.S. and Europe. These ESG data sets, and rankings / ratings are also used by many third parties in the methodology to create other awards, recognitions, indexes, and so on. This is why it’s critical for companies to engage with and improve these key ESG investor data sets and rankings as they flow down and are used by many investors and many other stakeholders. At the top – in the board room, C-suite — these are indeed critical recognitions and independent (to a large degree) profiles of a company’s ESG strategy, actions, achievements, and recognitions. Of course there’s grumbling from companies about the efforts to keep up and the independent views of the raters, and how the company may be presented in the ratings work. So how do the best of these ratings pay off for the public issuer? Consider: In terms of ROI for their awards efforts, sustainability rankings can help companies define internal performance measures, attract top talent and link executive comp to corporate sustainability efforts…so write the authors of an essay in Forbes. Victoria Mills and Austin Reagan of the EDF (Environmental Defense Fund) then add: Unfortunately, there’s a significant problem with these sustainability lists. The missing link, thinks EDF, is [corporate] public policy advocacy; companies can be doing more than just addressing their own ESG issues (and winning third party recognition for leadership and admirable rankings and scores from ESG raters). EDF thinks the most powerful tool companies have to fight climate change is their political influence. The report explains EDF views on rankings vs. ratings; analysis of rankings (“all have a major blind spot”, explains EDF); the challenges of integrating climate policy advocacy into sustainability rankings; and, a series of recommendations. The EDF opinions are sure to stimulate debate now among asset owners and managers, and within the corporate community. We’re all hooked on sustainability / ESG rankings, ratings, scores and other opinions; they’ve become ever-more important in the decision-making of key asset managers. So, in this brief report, EDF shares its perspective on the way forward to make corporate reporting on ESG more robust. Click here to view the 12-page report.